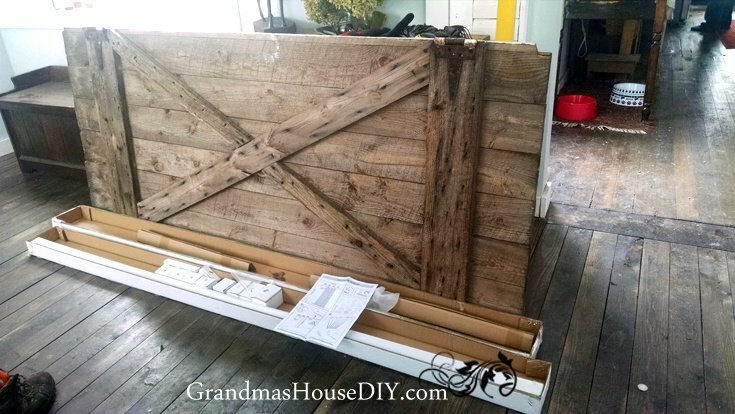 I’ve had my hanging barn door hardware for nearly a year now (I’m ashamed to say) so this project has been on my “to do” list for WAY too long! Being as this is an old farm I have the perk of having several old barn doors that I stashed in a safe place and have been drooling over for months. A door on my master bathroom is totally required, it is on the other side of the stairwell to the bedroom but, regardless, it was time to get this hung! Whether I’m actually going to be “using” this lovely hanging barn door or not, I believe it actually qualifies as artwork on the wall! 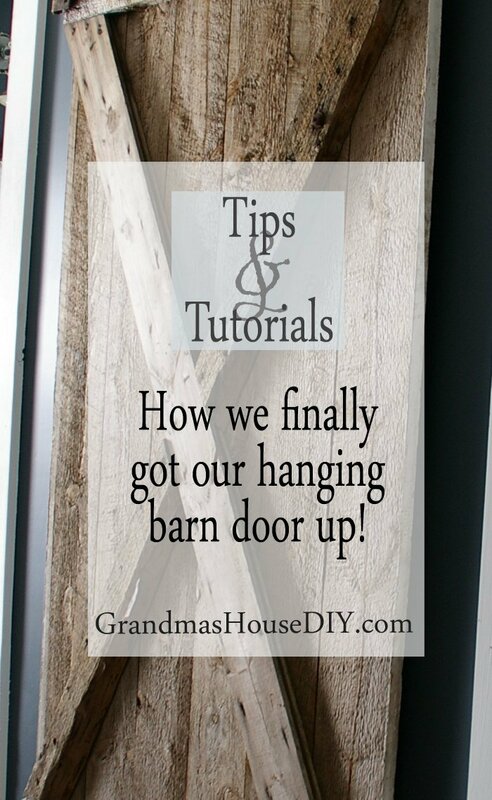 After reading multiple nightmare stories of hanging barn doors online I was a little apprehensive getting started. First, I spent an hour online the Amazon page of the hanging barn door hardware I had purchased months before. Within a few minutes of studying the pictures and reading through the question and answers section I got excited. Turns out, I made a really good choice in the hardware I purchased, it looked easy! And, I am stoked to say, I had this done in an hour, it WAS easy! I wish I could say I purchased it with that in mind but it being easy to install was just a bonus. The REAL reason I purchased this specific hardware was the price. It was only $80! Other hanging barn door hardware I looked at was over $200! I brought the door and the hardware in before I went through all of the instructions. 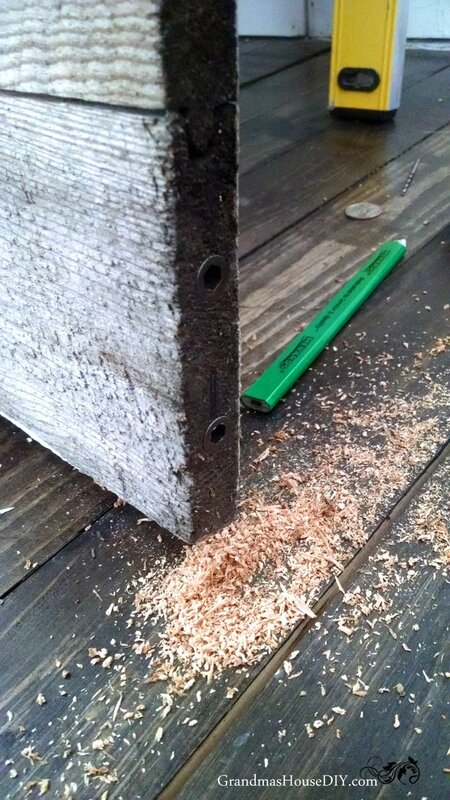 Then, I grabbed my drill and started the entire process by adding the wheels to the top of the door, this was a simple as drilling out the correct sized holes and screwing in the anchors before attaching the top wheels with screws. With the wheels on the top of the door attached I took the measurements then headed up stairs with my six foot level to decide where to attach the five mounts for the rod. This was as simple as drawing a level line on the wall and then adding them in, three of them I attached to studs, the other two I used sheet rock anchors. Then I set the rod in place and secured it using the mounts. With the rod up and mounted I just had to set the door on the rod and TA DAH! All done! Now, my master bathroom and master closet are finally complete 🙂 I can’t wait to fully reveal them to you guys! Thank you Diana! We’re so happy to finally get it up! 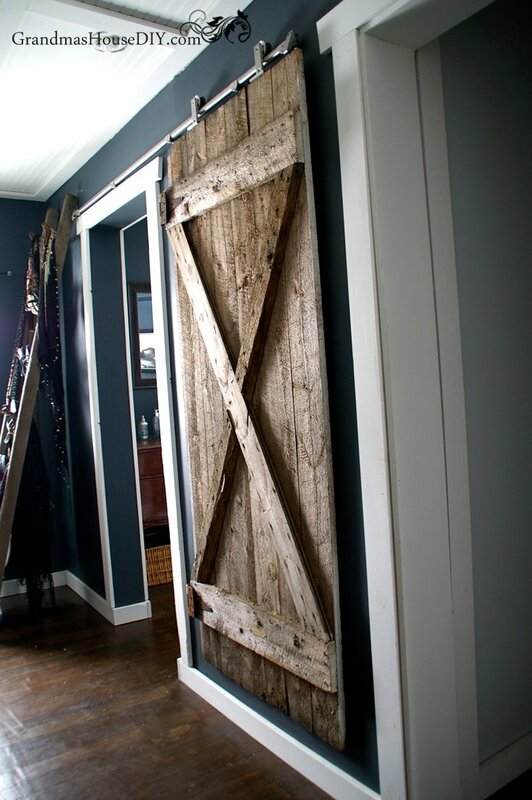 I absolutely love barn doors and yours looks fantastic… I love the raw wood against that scrumptious blue wall! Absolutely gorgeous! 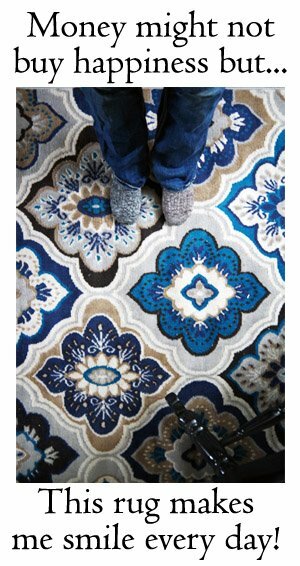 Thanks for sharing at Welcome Home Wednesdays, pinning! Wow!! That barn door is gorgeous! You and your husband did a fantastic job! 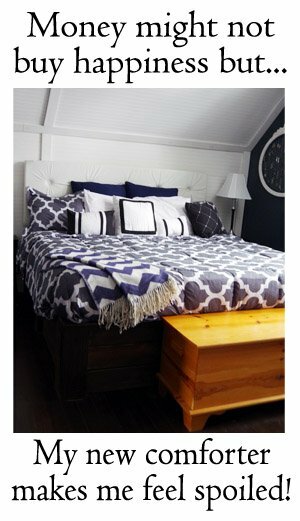 I love the way it looks with the blue wall, white trim, and wood floors! Thanks for sharing! Oh my goodness, this is gorgeous. We are putting one of these on our lake house. I will post pics one completed. Found you on #OverTheMoon link party! Michelle, I can’t wait to see it! Thanks for coming by! Woo hoo! Your door looks great. I like the rustic wood that you used. Stacey, thank you so much!! It looks fantastic! I love how rustic the door is, absolutely beautiful! Love this! We have two barn doors that we still haven’t put up. Really cute, I love it! I have two in my craft room and hubby just hung one on my she shed. I just love the way they look! Thanks for sharing with SYC. Yeah they’re so cool and rustic! I love how they move totally out of the way too as opposed to a door always hanging out into the room, thanks! It looks amazing! You two did an incredible job. That is fantastic! Thanks for sharing at Home Sweet Home! I am so delighted to discover you. Am visiting from the Happy Now linkup. 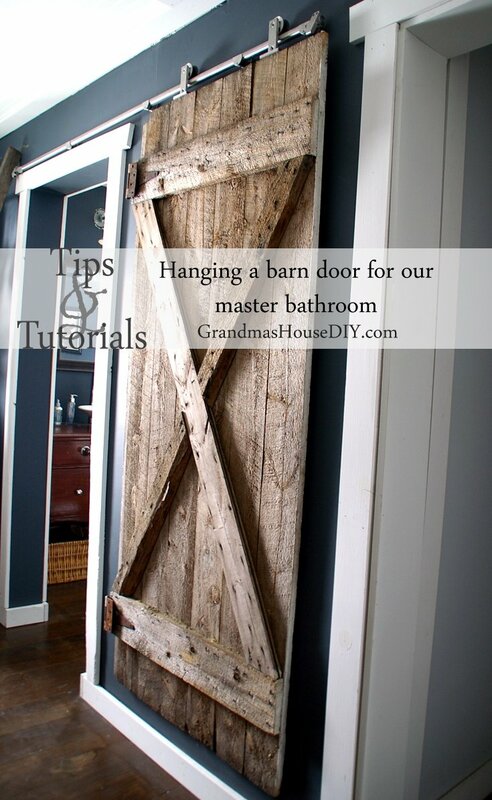 What a wonderful idea to use the barn door. Love how it won’t swing out. It was also so very cool to see the photos and realize that it really was just that easy. Wow! One hour? That’s awesome! I’m definitely going to look into that hardware, as I’ve got a spot where I’d like to install a barn-style door. One question, though: is the door steady since it’s basically just hanging there? Would you recommend a bottom track or casters on a door for stability? 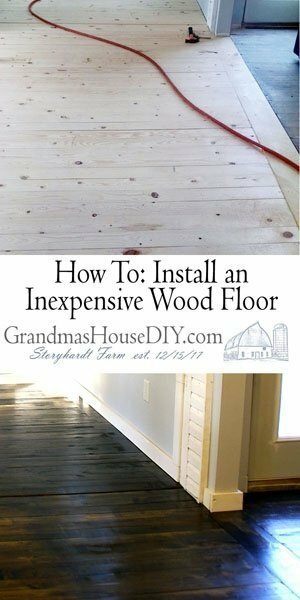 Hi Leslie, yup I would definitely recommend that hardware, its really good quality and inexpensive. Without a bottom track (Or I was actually thinking about track along the wall across the bottom of the door, maybe with a couple of wheels on it?) the bottom of the door does and will scrape against the wall. We use it so little it isn’t a big thing for us, we just pulled the door out when we slide it. I LOVE this!! 🙂 Looks amazing!!! Tarah this is not only gorgeous but it’s such a perfect statement piece for your darling home. Olivia, thank you so much! Carla, I love ours! And a pocket door would be a lot more work 🙂 Thank you for coming by!! Wow! What a project! The barn door looks wonderful 🙂 Thanks for sharing at Together on Tuesdays. Nice. I’ve started getting a hankering for barn door. But wouldn’t work in my current house. We need to get a fixer upper! Thanks for sharing on Family Joy Blog Link-up. Please come back and join us again! Remember to leave your host a comment to increase the chance of being featured. I love this! Our master bathroom has these ridiculous double doors that open inward and block up one of the sinks. A hanging barn door would be perfect there. Pinned and sharing. Thanks for linking up at Family Joy Blog Link-up Party this week! French doors are so great in theory but not always in application! Love to see it if you end up with a barn door, thanks for coming by!! Tarah, come grab our featured button this week on Sunday at Family Joy Blog Link-up! Congrats! Thank you so much Charlotte!! Thank you Janice for coming by! Very nice and happy that you got the door up. Hey Lindsay, I hear ya! This was the only spot we could have one! Your hanging barn door looks great, especially against the dark wall with the white trim. The aged wood really pops. I totally understand about having materials and a project hanging around for a year or more. Congrats on striking this project off your to-do list! Thank you so much Carol, it was such a relief to finally have this done! I think of it more as artwork then as an actual “door” we hardly ever use it but when we’ve needed it its been good to have! Loved your post! Thanks for linking up at the Ultimate Pinterest Party last week. You were featured this week on my page! Can’t wait to see what you link up this week! Oh thank you SO much Ali! Have a great week! The door looks great! Thank you for sharing at Ravenwould. That really is a beautiful door! I love how you’ve used it on the rail – what a great look! Thank you so much for sharing with us at Hearth and Soul, Tarah. Sharing! I hope to see you back at the party when we return from summer break this coming Monday August 7th. Have a great weekend! Oh my word, I SO want one of these! We have an old farmhouse! We have an old barn! We have old barn doors! Well, now I’ve pinned this, so I’m one step closer, right? 😉 Thanks for the inspiration…stopping by from Encouraging Hearts & Home! Elizabeth, thank you so much for coming by! It took me forever to find inexpensive hardware on Amazon but the search was totally worth it and it was surprisingly easy to hang! I love your barn door. I would love to have one in my home. Maybe one day. Thank you for the photos, and showing us how you did it! It looks amazing, you did a wonderful job! Thank you for sharing at The Really Crafty Link Party. Pinned!